To achieve this, the project uses an innovative social metabolism model called ‘MuSIASEM’ to analyse and demonstrate patterns in society’s use of natural resources and the subsequent environmental impacts. The application of this MuSIASEM model will reflect input and questions from policy-makers, whilst its outputs will be used to help stimulate discussion about the interconnecting and consequences of different expectations and aspirations. MuSIASEM has already been developed and proven in other situations. The website http://nexus-assessment.info, arising from a project for the FAO, gives a good overview of how the model works and the type of questions plus examples of the cases to which has been applied. For more information about the Hutton's role in the project, contact Keith Matthews keith.matthews@hutton.ac.uk or Kirsty Blackstock Kirsty.Blackstock@hutton.ac.uk. The Deliverable can be found within the project document repository or by clicking here. We have been busy promoting the project and its progress at a variety of events including the International Sustainable Transitions conference in June 2018; the RGS-IBG conference in August 2018 and workshops with the European Environment Agency. The second progress meeting was held in Naples (4-6th June 2018) where we discussed how the MAGIC approach could be used to influence the delivery of public policy and for global objectives such as the Sustainable Development Goals. Throughout 2017 we conducted interviews and meetings with policy makers that are connected with the development and implementation of the Common Agricultural Policy. Through the analysis of interviews and policy documents, and after discussing our conclusions with stakeholders, we have selected a narrative to explore using the quantitative story telling approach; in the next few months we will focus on exploring the basis of EU farm competitiveness and its wider consequences, including if there is a trade-off between competiveness and delivery of public goods. Click here to read the Milestone Report that describes the narrative selected (pp. 19-23). On 8-10th May 2017, MAGIC held its first progress meeting. Members of the Hutton team, together with other partners travelled to Wageningen to review progress and plan our next steps. The first day of the meeting was attended by the three General advisors from our project Advisory Board, who gave us some useful feedback to inform our future plans. On 2-4th May 2017, Kerry Waylen from the Hutton attended the 2017 Alter-Net conference. The theme of this international conference was "Synergies, conflicts and trade-offs in the relationship between nature and society" so there was a strong connection with the work of MAGIC. Kerry presented "How do European policies shape nature-society interactions? Introducing the MAGIC Approach" and the presentation should soon be available from the conference website. On 29-31th March 2017, members of the Hutton team travelled to Wageningen, where the Wageningen University partners hosted a meeting with ourselves, Universitat Autònoma de Barcelona, and Twente University. The focus of this meeting was developing the application of MuSIASEM, the MAGIC-project engine, to the pilot cases considered within WP4 of MAGIC. Considering how to take account of the role of Climate Change in MAGIC is challenging, as it impacts on - and is influenced by - nearly every societal process and policy. On 15-16th March, the MAGIC partner 'Climate Analytics' hosted a meeting on the role of climate change in the project in Berlin on 15-16 March, attended by Mike Rivington from the Hutton, together with remote participation by Universitat Autònoma de Barcelona and the Joint Research Council. In early February 2017, members of the Hutton team travelled to Brussels to meet and interview contacts in DG Agriculture. These interviews supported the work to build a 'Nexus Dialogue Space' which is led by the JRC (Joint Research Centre). These interviews will also inform the future activities of WP5, which is managed by Hutton. Several presentations about MAGIC were delivered by Kirsty Blackstock at the 2016 Annual International Conference of the Royal Geographical Society (30th August - 2nd September, London). This large conference gave a great opportunity to share ideas with several other researchers and projects working on the water-energy-food nexus. Each talk focused on different aspects of the project, e.g. introducing QST, considering post-normal science. Following the conference, Kirsty wrote this blog post for the Sustainability Currents website. 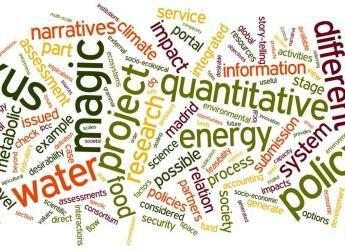 On 13-15th June 2016, The Institute of Environmental Science and Technology at the Autonomous University of Barcelona (ICTA- UAB) hosted the kick-off meeting for the MAGIC project. The innovative and environmentally sustainable building was a good setting for stimulating discussion!